Arguably we are Yorkshire’s finest bespoke garden decking specialists, all of our design inspirations are founded on each clients usability requirements. You will note from this case study that we have created multi levels, ultimately arriving at a raised and staged area for our client to enjoy. 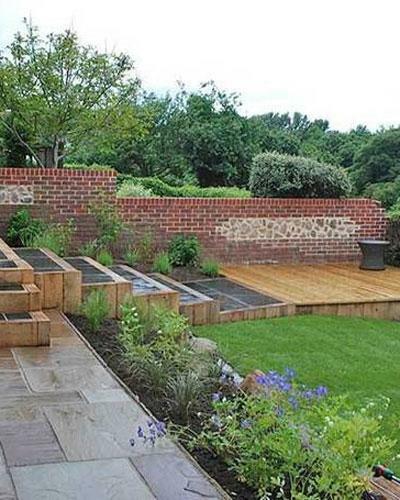 Black Limestone, which offers anti slip and a strong creative contrast has been introduced into several of the stepped areas; these are then supported by French Oak Sleepers and risers. This multi level and material project ultimately became the focal point of the garden, and now offers our client the ability to enjoy hours of stable relaxation throughout the year as well as a very functional area for entertaining. All of the works were undertaken by our craftsmen, and were completed on time and on budget.